Earning points and miles is the surprisingly easy part of award travel; it’s learning how to maximize value when redeeming that takes practice. In this post, TPG Senior Points & Miles Correspondent Jason Steele explains how to use your American Airlines AAdvantage miles to book the flights you want. Do you ever have trouble using your miles to book an award flight? You’re not alone! That’s why today I want to begin a series on how to book awards with several of the major frequent flyer programs, starting with one of my favorites, American Airlines AAdvantage. Before you can ticket any award, you’ll need to have enough miles in your account, and you might not be familiar with all the ways to earn AAdvantage miles. First, American Airlines still offers miles for flights based on the distance flown, unlike Delta and United, which now award miles based on a combination of the price paid and your elite status level. You can also earn American miles by using your AAdvantage number when you fly with one of the many Oneworld and other airline partners. In addition, American now has two credit card partners, Citi and Barclaycard. There’s the entry level Citi / AAdvantage Gold World Elite Mastercard (which offers a sign-up bonus of 25,000 miles after you spend $750 in the first 3 months), as well as the mid-range Citi / AAdvantage Platinum Select World Elite Mastercard (60,000 miles after spending $3,000 in the first 3 months) and the high end Citi / AAdvantage Executive World Elite Mastercard, (50,000 miles after spending $5,000 in the first 3 months). You can easily hold more than one of these cards at a time. For more information, check out my post on AAdvantage and US Airways Credit Cards Strategy for 2015. Barclaycard is also offering AAdvantage credit cards to existing US Airways Premier World MasterCard holders. There will be four consumer versions — the standard Aviator, as well as the Aviator Blue, Red, and Silver — and an Aviator Red card for Business. Another great way to earn American miles is to transfer them from the Starwood Preferred Guest program, which offers a 1:1 transfer ratio, plus a 5,000 mile bonus when you transfer 20,000 Starpoints. That makes the Starwood Preferred Guest® Credit Card from American Express a pretty good option for earning AAdvantage miles with everyday spending, since you effectively earn 1.25 miles per dollar if you use the transfer bonus. Finally, there are all sorts of other American Airlines partners that offer miles, including hotels, car rentals, vacation packages, cruises, and much more. Check out this page at AA.com about all the ways to earn miles, as well as my post on 21 Ways to Earn Airline Miles that You Might Not Know About. The American Airlines award chart has bargains like off-peak flights to Europe for 40,000 miles round-trip in economy. Photo courtesy of Shutterstock. Your first step in planning an award flight should be to consult the award charts for both American Airlines/US Airways flights and partner flights, so you can determine how many miles you’ll need. Take special note of the off-peak awards, which offer discounted . In addition, American Airlines credit cardholders (both Citi and Barclaycard), can make use of reduced mileage awards within the United States and Canada. The next step is to determine which partner airlines fly to your destination so you can find your ideal routing. I like to use the Wikipedia pages for airports at my origin, destination, and major airline hubs in between, as each entry shows clearly which carriers fly which routes. No, Wikipedia is not 100% accurate, but it’s more likely to show old routes that have since been cancelled than to fail at showing new routes. The other problem with this technique is that American is known for having some of the most restrictive award routing rules. In most cases, you cannot transit one zone in order to travel to another, although there are some exceptions. For example, you cannot travel to Australia via Asia; however, you can connect through Japan (Asia Zone 1) in order to reach Bangkok (Asia Zone 2). The award routing rules are so complex that you should really read Eric Rosen’s entire post on American Airlines Award Routing Rules. American Airlines has many Oneworld and other partners that can help you reach your destination, but they don’t all show up on AA.com. When you start searching for flights online, you’ll find that American’s web site is actually very good at searching for award availability, but only among the partners that appear there. Therefore, it’s helpful to know which of American’s partners do show up on its website, so you can know what you’re not seeing and find alternate ways to search for award space on the other carriers. As you can see, you can only book awards on eight different partners from AA.com, leaving nine Oneworld partners and six other partners that you have to look for elsewhere. To find these award flights, you’ll have to be a little creative. The easiest method is to search the websites of other Oneworld partners to find awards. I like to use the British Airways site to search for award availability that I can’t find on AA.com. There are also tools like ExpertFlyer that can search for awards on some of these carriers. Finally, you might actually have to call American Airlines and have their reservations agents tell you which partner flights are available as awards. American Airlines has impressive domestic award space, but international awards can be harder to find. If I can use American’s website to search for the partners I need, then I’ll always start with a simple search from my home airport on the off chance I get lucky. American Airlines does have very good domestic award space, and award flight searches within North America and Hawaii will show space on US Airways, Alaska Airlines, and Hawaiian Airlines. As you move beyond North America, the success rate of the website will go down for several reasons. First, AA.com has trouble piecing together awards that have more than two flights. It usually presents some, but not all options with three flights, and it rarely shows itineraries that involve four or more flights, which are often necessary to reach secondary cities in foreign countries, especially if you have to take a connecting flight just to reach your international gateway here in the United States. Also, AA.com sometimes fails to display options that require an overnight stopover of less than 24 hours, which is permitted. Finally, it may be necessary to fly on a partner that is not searchable online at AA.com. In each of these cases, you’ll have to find award space first, and then call American to have it ticketed. Fortunately, American has eliminated its telephone booking fee. My next step in searching for award availability is to perform separate searches from my origin to an American or US Airways hub (LAX, ORD, JFK, PHL, PHX, CLT, DFW, MIA), and then again from that domestic gateway to my destination. Finally, I’ll try to fill in any missing pieces by searching elsewhere for partner award space not visible on AA.com. One of the biggest problems with the American Airlines program is its reliance on British Airways for award travel to Europe and beyond. There’s nothing wrong with BA itself, other than the fact that American passes on its outrageous fuel surcharges, which often exceed $500 per person each way for business and first class long-haul flights. There are even instances where fuel surcharges for economy class award flights approach or exceed the cost of a paid ticket! The solution here is to avoid British Airways flights at all costs when you’re booking awards. Thankfully, there’s a way to exclude BA flights from your search results. However, you will also exclude AA flights that connect in London to short-haul, BA flights with low surcharges. By deselecting British Airways from your search results, you can avoid the associated high fuel surcharges. Another way to avoid BA’s surcharges on flights to Europe (when there is no American Airlines or US Airways award space) is to search for flights via Madrid on Iberia from its North American gateways at Miami, New York-JFK, Chicago-O’Hare, and Boston (seasonal). Iberia adds fuel surcharges of around $100 – $150 per person each way in business class, but that’s only about a third of what you’ll pay for a British Airways flight. Despite the limited number of partners that can be searched online, as well as its restrictive routing rules, American remains one of my favorite frequent flyer programs due to its award hold policy and its flexible change policies. Awards can be held until midnight (Central time) five days after you make your reservation. This means that you can (and should) go ahead and place a hold on whatever flights you find, while continuing to try to find something better. This generous policy also allows you to hold an award itinerary while you transfer points to miles from your Starwood account, a process that can take several days. But even once you’ve ticketed your held reservation, American still allows you to keep your options open. Award tickets can be changed at no charge, at any time, so long as the origin and destination remain the same. This means that you can change your flight times, dates, airlines, routing, and even class of service for no fees other than whatever additional miles are required to move up to a premium cabin. The only exception is the fee that applies when you downgrade your class of service and need miles refunded. Unfortunately, if you do have to change your origin or destination, or cancel an award altogether, then you’ll have to pay a $150 reinstatement fee to cancel the first award, and $25 for each additional award reinstated at the same time for the same account. So even after your flight is ticketed, you still have plenty of opportunities to look for better alternatives so long as your origin and destination remain the same. For this reason, I will initially accept imperfect awards that require several changes of aircraft or a very circuitous routing. So long as my origin and destination are ideal, and I don’t have to purchase any positioning flights, then I’m confident I’ll end up with the flights I want. And if I don’t, at least I’ll have secured some means of getting from A to B. 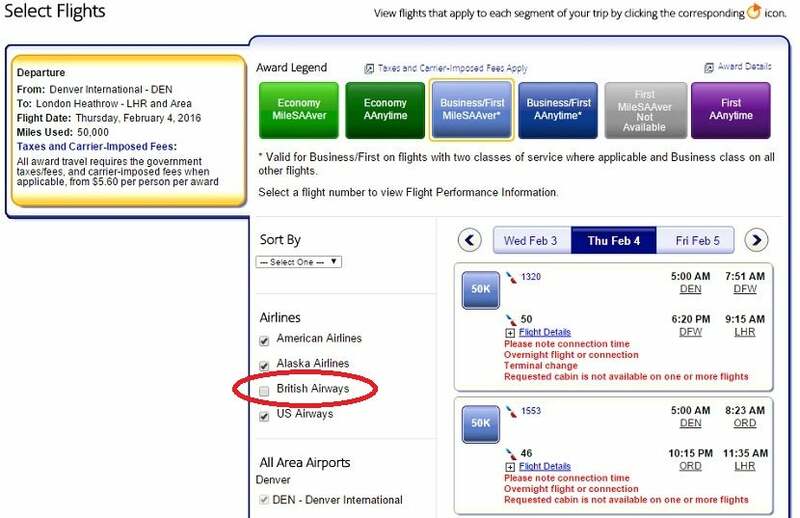 The idea is that better awards flights might open up in the future, or a schedule change might allow you to request a more convenient itinerary on flights operated by American or US Airways. Furthermore, I’ve found that American Airlines staff can be quite willing to re-accommodate passengers on better flights on the day of travel, especially if just one of those flights is delayed. For example, last summer I was ticketed to fly Denver-Dallas-JFK-Madrid-Rome, but a helpful agent at the lounge suggested that she change my flights to just Denver-Chicago-Rome, and I even received a refund for the fuel surcharges I paid for the Iberia flight that I ultimately didn’t take. By resisting the devaluations that have plagued other programs, American Airlines AAdvantage miles have remained uniquely valuable. When you take the time to explore all of the award travel strategies available, you’ll find that you can ticket some incredible award flights with these miles. What are your favorite awards that you’ve booked with AAdvantage miles?